Moves you. Even when it's standing still Brilliant to drive and striking to look at, the new Mazda6 Saloon makes a stylish statement in town, on business and on long drives. Equipped with next generation technology and styled with Mazda’s highly acclaimed KODO: Soul of Motion Design, the new Mazda6 redefines the executive saloon. SURROUND YOURSELF IN LUXURY Designed to stimulate the senses, the driver-centric cabin has an air of quality and spaciousness, whilst the GT Sport Nav+ interior features soft yet supple Nappa leather seats. Brilliant to drive and striking to look at, the new Mazda6 Saloon makes a stylish statement in town, on business and on long drives. Equipped with next generation technology and styled with Mazda’s highly acclaimed KODO: Soul of Motion Design, the new Mazda6 redefines the executive saloon. Sit back and relax in the spacious human-centric interior created by Japanese Master Craftsmen, focusing on the ultimate in driver and passenger comfort. Its dynamic design and low profile provides the car with an impressive presence on the road, whilst our latest colour Soul Red Crystal, vividly expresses every line and curve. Driving has never been more relaxed or enjoyable with our latest i-ACTIVSENSE safety systems, putting you in full control. 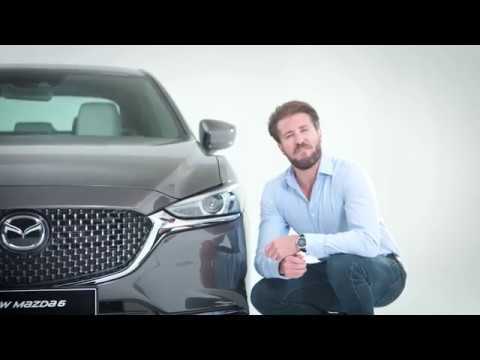 The latest SKYACTIV Technology delivers outstanding performance and fuel efficiency without compromise and intensifies that Jinba Ittai connection you feel within the car. Make a Statement Our aim with the new Mazda6 Saloon was to provide the driver with a thrilling sensation behind the wheel, whilst having the confidence of being in total control of the car in all conditions. New advanced technologies have been introduced into our latest range of SKYACTIV engines, ensuring a quick and precise response to your true driving intentions as you squeeze the accelerator. Rediscover the joy of driving Sit back and relax in the spacious human-centric interior created by Japanese Master Craftsmen, focusing on the ultimate in driver and passenger comfort. Inside the cabin, aerodynamics are perfectly honed to ensure minimal noise, vibration, and harshness (NVH), ensuring the cabin is a peaceful place to be. SKYACTIV Technology Stunning design also needs to deliver on performance, handling and ride quality. Mazda’s ground-breaking SKYACTIV Technology featured in Mazda6 Saloon’s engine, transmission, chassis and body has an unerring focus on creating a true feeling of unity between car and driver, what we call Jinba Ittai. With responsive, dynamic performance and leading aerodynamics, a comfortable and sporty driving experience is guaranteed each and every time, without compromising on efficiency. 360° View Monitor City parking and manoeuvring becomes much less of a challenge with our new 360° View Monitor. Four cameras and eight sensors provide you with eyes all around the car. When backing out of a space, you get a bird’s eye view of the area around the vehicle with camera views displayed on the 8" Colour touch-screen. If you are getting too close to an object, an audible alarm will sound. The cameras also help you to see blind spots, around T-Junctions and as you drive past objects to the side of you. MZD Connect Effortlessly connect to your world through our advanced infotainment system, MZD Connect. Featuring a large 8” colour touch-screen display, you can easily switch between your favourite music, online radio, social media and text messages*. The system can also be operated via our intuitive Multimedia Commander which is positioned on the centre console, or by the controls placed on the steering wheel allowing you to keep your eyes on the road ahead. SKYACTIV Engines Available with either 150ps or 184ps power output, our 2.2 litre SKYACTIV-D Diesel engine is an excellent choice for those who drive on constant long journeys or that carry and tow heavy loads. Then there is a choice of our refined 2.0 litre SKYACTIV-G Petrol engine available in 145ps or 165ps power output, or for those that want more power and torque, our 2.5 litre SKYACTIV-G Petrol engine is available which provides 194ps power output and a 21% increase in torque. SKYACTIV-Chassis The new Mazda6’s SKYACTIV-Chassis and suspension is perfectly tuned to tackle a twisty road, navigate a sharp corner or even deal with an emergency lane change at motorway speeds. Active Driving Display with Traffic Sign Recognition the window-projected Active Driving Display provides you with key vehicle and road information that is right in front of you on the windscreen.